Magnesium is a white metallic element for which the symbol is Mg. It is the most abundant intracellular divalent cation, 1 percent of which is extracellular, 31 percent found in the cells, and 67 percent in bone. 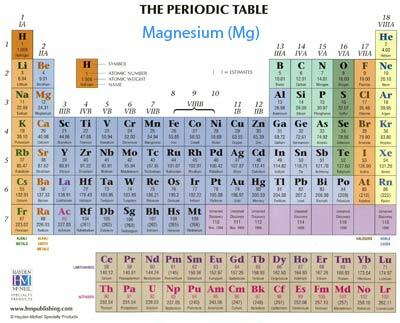 Magnesium exists in 2 forms in the cells: one in solution, which is in equilibrium with the diffusable form in plasma, and a larger quantity bound to organic compounds. Most of the magnesium found in the cells is bound to ATP (the energy of the cell) and equilibrates with free magnesium ions. Shifts in free magnesium concentration therefore may help regulate ATP stores, noting that ATP is critical to nearly all metabolic functions, which makes magnesium essential to sustain life. Dietary sources of magnesium include green leafy vegetables, seeds, grains, nuts, peas, beans, cocoa derivatives, avocado, brown rice, buckwheat, seafood, sprouts, soy beans, wheat germ, and several other sources. After consumption, approximately 30-40 percent of dietary magnesium is absorbed in the jejunum and ileum of the small intestine, which may be more in states of magnesium deficiency. As noted in the Journal of The American Medical Association, January 5 of 2005, "Magnesium is required for a wide range of biological functions. Apart from being essential for the maintenance of genomic stability and for DNA repair, magnesium has a crucial role in modulating cell proliferation, cell cycle progression, and cell differentiation...and an important role in maintaining the antioxidative status of the cell." A high magnesium intake, it was found, may reduce the incidence of colorectal cancer in women. In the year 2000 a series of "Magnesium Reports" was published to underline the importance of this nutrient. In those reports it was noted that, "Laboratory and clinical research have all pointed to the involvement of magnesium in hypertension, coronary artery disease, insulin resistance, diabetes mellitus, and the metabolic syndrome." The "ionic hypothesis" of cardiovascular and metabolic disease was proposed in which the conditions mentioned above were characterized by depressed intracellular free magnesium. In that same article it was stated that, "It seems reasonable to consider the use of magnesium supplementation by either dietary or pill supplementation as a therapeutic option for subjects with these common cardiovascular and metabolic conditions." In fact, cellular magnesium deficiency manifests itself clinically in vasoconstriction, hypertension, arterial stiffness, insulin resistance, hyper-insulinemia, left ventricular hypertrophy, increased platelet aggregation and thrombosis, increased sodium retention and calcium excretion, and an increased sympathetic tone potentiating catecholamine release affecting the central, peripheral and sympathetic nervous system as well as adrenal gland. It should be noted that since magnesium is mainly an intracellular ion, its measurement in the serum is an inaccurate index of total body magnesium stores. The more significant intracellular free magnesium is measured by nuclear magnetic resonance spectroscopy, which is not routinely available for clinical use. After potassium, magnesium is the most common intracellular cation in the body. It is natures calcium channel blocker, which is important since excess intracellular calcium can lead to irregular heart rhythms. In addition, magnesium is also responsible for cellular potassium uptake, and therefore a state of magnesium deficiency by itself can lead to potassium loss. Among the possible cardio-protective mechanisms of magnesium, as noted in the Second Quarter Of 2000 Magnesium Report, are "anti-arrhythmic effects, calcium channel-blocking effects, improved LDL cholesterol/HDL cholesterol ratio, improvement of nitric oxide release from the coronary endothelium, improved response to potassium repletion in inhibition of platelet-dependent thrombosis (blood clots), protection against free radical induced injury, protection against reperfusion damage, reduction in lipid levels, reduction of potassium loss, and vasodilating effects which improved myocardial collaterals." Many Americans seem to be deficient in magnesium since it is not a major component of most diets. Oral supplementation of approximately 500-600 milligrams of elemental magnesium per day is considered safe in most individuals with normal kidney function. At higher doses diarrhea may become an adverse effect. Magnesium is necessary for intracellular potassium homeostasis and therefore when magnesium deficiency exists, potassium repletion may be impaired. As magnesium and potassium levels decline the incidence of irregular heart rhythm is increased. In addition there is a significant relationship between calcium and magnesium. Magnesium is a vasodilator and calcium is a vasoconstrictor. High levels of calcium and low levels of magnesium may result in lethal arrhythmias. Chronic magnesium deficiency results in a loss of intracellular potassium and an increase in intracellular calcium. Clinically we use magnesium supplementation to reduce neuromuscular activity such as muscular spasms, in addition to its calming effect, which is very useful in anxiety as well as insomnia. In the final analysis, magnesium is one of the most important nutrients in the world.